This quick reference handbook covers the diagnosis and treatment of eye disease in a range of exotic companion animal species, including rabbits, rodents, reptiles, birds, amphibians and fish. It clarifies when extrapolation from cat or dog eyes is appropriate, or when new information is needed to ensure that diagnoses and treatments are appropriate for the particular species. Writing in an accessible and down to earth style, the author brings a wealth of personal experience to this specialised subject area. The book contains many ophthalmic photographs of both anatomy in normal eyes and pathology in abnormal cases. 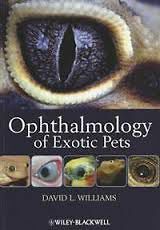 It also includes a separate chapter on the common ophthalmic features of exotic pets, discussing what can be learnt from cross-species comparison and another chapter giving a brief history of comparative ophthalmology. Ophthalmology of Exotic Pets is an invaluable aid for veterinary practitioners and students with an interest in exotic pet species, as well as for veterinary ophthalmologists.